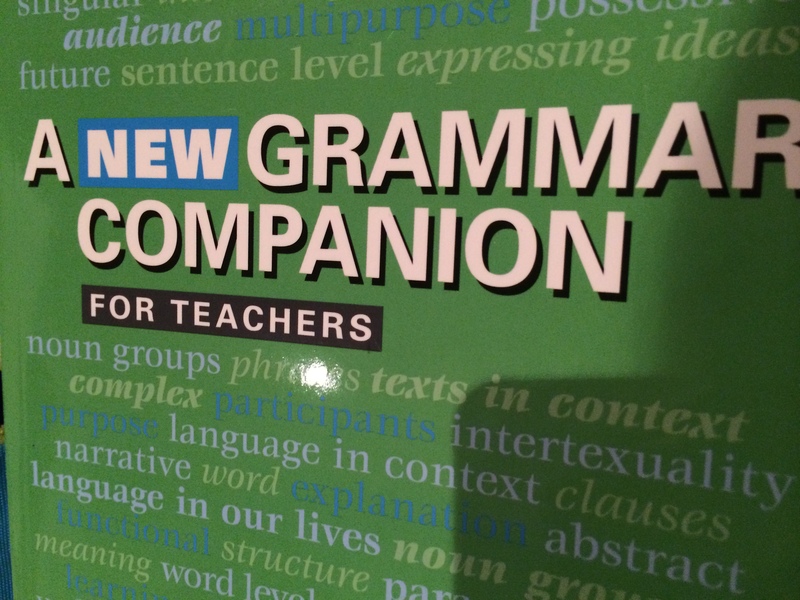 This ‘New Grammar Companion’ supersedes the other ‘Grammar Companion’ which is still quite adequate but not as in line with the ‘new’ English Syllabus. When I graduated from ‘Teacher’s College’ after three years with my Diploma of Teaching I was ready to integrate all my subjects, teach the ‘New English’ and practise Piaget’s theories by progressing through to symbolic representation of number after beginning with concrete materials and pictorial representations. This was the ’70s. I had learnt computer programming using Fortran and photocopiers were only found in libraries. A far cry from today and the technology that is at the fingertips of even the poorest citizens in our Western world. As teachers and diagnosticians we are constantly trying to work out how to improve our pedagogy to help our students to become capable and responsible citizens of the world. In the last twelve years I have been trained to teach reading and writing at least once very two years. I have been taught how to teach problem solving in Maths at least four times and have had at least three lots of professional development with regard to teaching the vocabulary of Maths. Then there has been training in Bloom’s Taxonomy, Quality Teaching and Formative Assessment. What have I learnt from this – apart from the fact that we will never have all the answers ? Well, it has dawned on me that ‘new’ can have several different meanings. Sometimes it can be a new name for an old method that has come back into favour. Integrated lessons were all the rage in the 80’s. They disappeared for a little while, then snuck in a little with COGs units and are now back in full swing with 21st century learning programs such as project based learning. I am also coming to understand that ‘new’ can mean a change of emphasis. The saying, ‘students come to school to watch teachers work’ certainly has been true of the way we have taught in the past. The aim is now for the students to take ownership of their learning in situations where they are pursuing their own inquiries and are being helped to articulate the learning that is taking place by reflecting with their peers and the teacher. I am learning that I enjoy being exposed to fresh approaches and that it is fun to give them a ‘go’. Its interesting to ‘play’ with technology, ideas, and fresh methods and watch their effectiveness in terms of student engagement and understanding. Most importantly I am being encouraged to reflect on my ‘new’ learning in relation to what I have learnt in the past. In this way I can hang on to what are effective teaching practices, force myself to let go of comfortable, useless habits and learn to understand and apply improved methods of teaching and learning. As the pace of change quickens and what is ‘new’ loses its gloss faster than ever, I have also been learning to appreciate the importance of being connected to other teachers via social media. So much can be gained from sharing and questioning our ‘new’ knowledge and experiences. I love this post. I graduated from Teachers college with my 3 year diploma in 91, and I do notice how some things that are now considered ‘new’ were also being talked about back then. The integrated units you described are a great example. I guess the biggest differences I now see are the personalisation/differentiation of learning, which wasn’t emphasised so much when I began teaching, connectedness, and the idea of empowering students to follow their own inquiry projects. However much of what is now described as ‘new’ seems really to be a rediscovering or rebadging of practices that have been in place for decades. I wonder why some of them didn’t stick the first time around. Thanks for your thoughts Corinne. I often think about why things tend to go in cycles. Maybe we are doing similar things but better. It worried me that when text types came into fashion, writing was becoming too formulaic and stilted. The fact that informative texts are allowed to be descriptive and persuasive now, pleases me very much. Even though we are involved in 21st Century learning projects at our school, we still teach Mathematics and Literacy according to the syllabus following the continuums. We have put the continuum into several ‘I can’ statements and we ask the students to reflect on their progress by referring to these on ‘Bump it up’ walls. This is exciting because the students are taking ownership of their learning and being able to see what they need to do to improve. The integrated units of the past allowed for differentiation but the progress of each student wasn’t as closely monitored in relation to the learning outcomes. Maybe the gaps in learning made thorough teachers sceptical of these methods.